When you find your PC runs slower than before, maybe you need to clean up the trash files of your computer with 4Easysoft Registry Cleaner. This registry cleaner, or the registry optimizer, can help you clean up the registry errors, record history, junk files… to speed up your PC and improve the system performance. This powerful system cleaner also provides you with many incredible functions. 4Easysoft Registry Cleaner, also serves as a privacy protector, can help you scan your disk and remove the record history after using some applications to protect your privacy. Moreover, this software can also be called as the system manager for it can adjust your registry parameter to optimize your system. Besides, some useful tools, such as IE Manager, Startup Manager, Uninstall Manager, and System Tools, are also brought to you by this registry optimizer. 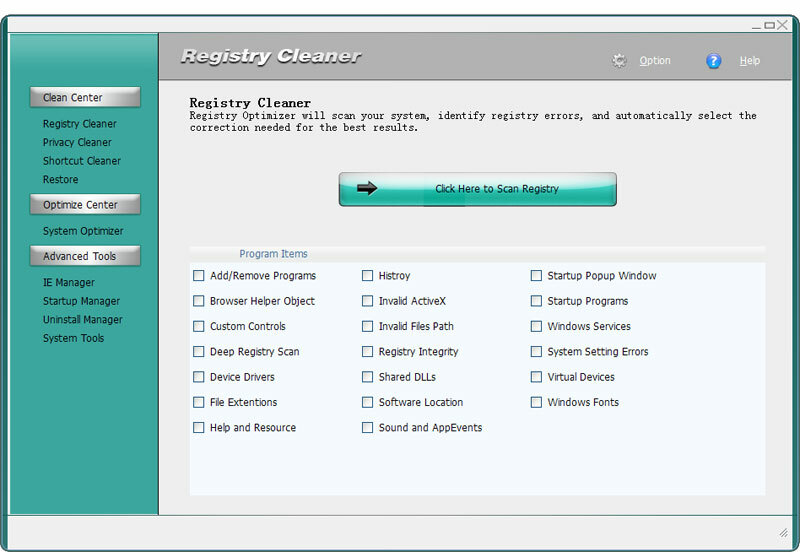 4Easysoft Registry Cleaner can have a quick scan on your system and help you remove the registry errors to improve your system performance. This registry cleaner can help you clean up the record history, cookies… to protect your privacy. Also it can remove those invalid shortcuts. In order to minimize the risk, this system cleaner software provides you with automatic backup of each change and restore points to undo any changes. 4Easysoft Registry Cleaner can help you optimize system parameters to speed up your PC. This tool can help you to restore and customize your Internet Explorer. You can set the home page, the window title, etc. as you want. To help have a fast PC startup, 4Easysoft Registry Cleaner can list all the automatically started applications, and then you can choose which ones are to be deleted. This software can assist you to remove those unwanted software safely and easily from your computer through the function of “Uninstall Manager”. 4Easysoft Registry Cleaner also provides you with a convenient access to some useful utilities, such as Registry Editor, DirectX Diagnostic Tool, Disk Defragmenter, etc., which are built in your Windows.